1.Reduced Cost of accounts payable and payments – Checks cost anywhere from $3.50 - $20 per unit to print when considering hard and soft costs. Converting checks to electronic payments reduces the number of printed checks and reduces your overall cost. Outsourcing the remaining checks to your payment automation provider can bring the cost down to just $1.00 per check. That's a significant savings. In an example, let's consider a company that issues 1,000 checks per month at $5.00 per unit. The current cost of issuing payments is $5,000 per month. Successful vendor onboarding campaigns should convert at least 70% of those payments to a digital payment method. Right out of the box you have $3,500 in cost savings. The remaining checks would only cost $300. Netting out a savings of approximately 94% of operational costs simply by removing paper from the process. 2.Efficiency Gain – Added to the cost savings, there is significant labor (man-hours / time) associated to the process of printing checks, sorting, stuffing, and mailing. The process is more complex for those departments that seek to shuffle high dollar checks into a certain stack for hand signing. For example, in order for a company to issue 1,000 checks per month, they may realistically average 2 people working 3.5 hours a week or 28 hours a month. Migrating to automated payments that include ePayments can cut that time by 90% allowing your staff to focus on financial analysis and measuring and tracking KPIs, not handling and pushing paper processes. Recently, the CFO of a company whose average A/P spend is approximately $4.5 M per month shared with us his Return on Investment metrics for his payment automation project: Specifically for converting checks to electronic payments (ePayments) in Accounts Payable. 1.With virtual card payments, he successfully experienced a 30% vendor adoption of the card application. This not only lowered his cost per transaction to zero (versus the cost previously spent on printing, stuffing, mailing checks), but he now makes a contribution to the bottom line by earning a monthly cash rebate of $16,875 on average. 2.Then after maximizing the V-Card vendor adoption, the company on-boarded 40% of their remaining vendors to ACH payments, producing in a $4,000 per month savings. 3.By deciding to convert to a payment automation platform, this controller made a $250,000 plus annual contribution to his organization. We assert that ANY organization can greatly improve their operational efficiency simply by changing the way they issue their supplier and vendor payments. It's that easy. No massive capital investment in researching and finding a new procure-to-pay solution is required. A fancy new ERP isn't needed. If you want measurable, attainable results in short order, consider converting to ePayments via a payment automation platform. 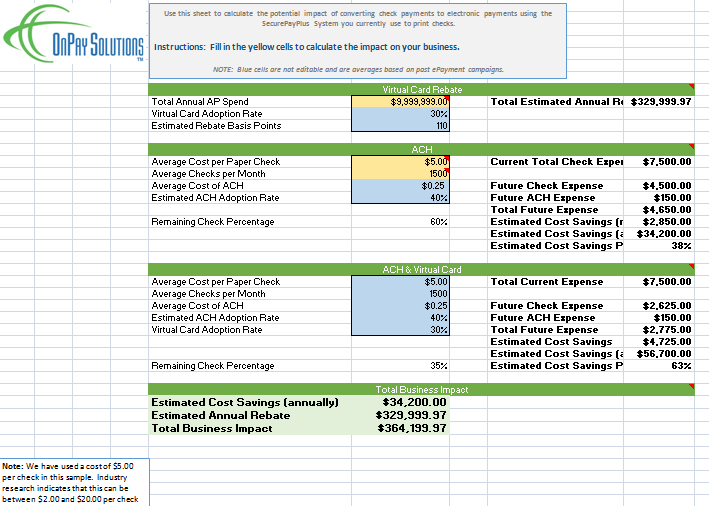 Use this ROI sheet to calculate the potential impact of converting check payments to electronic payments. Instructions: Once you request your Free ROI Calculator by clicking on the button below, you will fill in the yellow cells to calculate the impact on your business. NOTE: Blue cells are not editable and are averages based on past vendor onboarding campaigns.